D Three Enterprises, LLC v. Sunmodo Corporation, [2017-1909, 2017-1910](May 21, 2018), the Federal Circuit affirmed the district court’s grant of summary judgment of invalidity of U.S. Patent Nos. 8,689,517, 9,068,339, and 8,707,655, based upon a determination that they could not claim priority to provisional application no. 61/150,301. The patents-in-suit are directed to roof mount sealing assemblies, which allow users to mount objects on a roof and seal the mounting location against water. The District Court determined that the patents-in-suit could not claim priority from the provisional application because the claims were broader than the invention disclosed in the provisional application, and thus the written description requirement pursuant to 35 U.S.C. §112(a). The Federal Circuit noted that to claim a genus, a patentee must disclose a representative number of species falling within the scope of the genus or structural features common to the members of the genus so that a PHOSITA can visualize or recognize the members of the genus. All of the asserted claims save one recite washerless assemblies. The provisional application disclosed one washerless assembly, depicted in Figures 27−33 and 41, showing an an attachment bracket with W-shaped prongs. The district court noted that all of the applications disclosed this attachment bracket, such that a PHOSITA would not understand the attachment bracket to be an “optional feature.” However, the claims to the washerless version were not limited to attachment brackets with the W-shaped prongs. that the disclosure, when combined with the knowledge in the art, would lead one to speculate as to the modifications that the inventor might have envisioned, but failed to disclose. [PHOSITAs] will recognize certain modifications, permutations, additions and sub-combinations therefore. It is therefore intended that the following appended claims hereinafter introduced are interpreted to include all such modifications, permutations, additions and subcombinations are within their true sprit [sic] and scope. disclosure of the actual combinations and attachments used in the Washerless Claims. The Federal Circuit noted that adequate written description does not ask what is permissible in view of the disclosure, rather, it asks what is disclosed. The Federal affirmed that the provisional application lacked adequate written description of what was claimed, and thus did not support a claim of priority. In Droplets, Inc., v. E*Trade Bank, [2016-2504, 2016-2602] (April 19, 2018), the Federal Circuit affirmed the Board’s decision finding all claims of U.S. Patent No. 8,402,115 invalid as obvious over a published grandparent application due to an improper priority claim. One might think that if B claims priority to A, C claims priority to B, and D claims priority to C, that this is sufficient for D to get credit for the filing date of A. D After all should D be entitled to priority of C, C should get the priority of B and B should get the priority of A. However, that is not how the Federal Circuit interpreted Sections 119 and 120 in this case, nor how it has interpreted these statutes in the past. all of the prior applications and indicate the relationship (i.e., continuation, divisional, or continuation-in-part) between each nonprovisional application in order to establish copendency throughout the entire chain of prior applications. 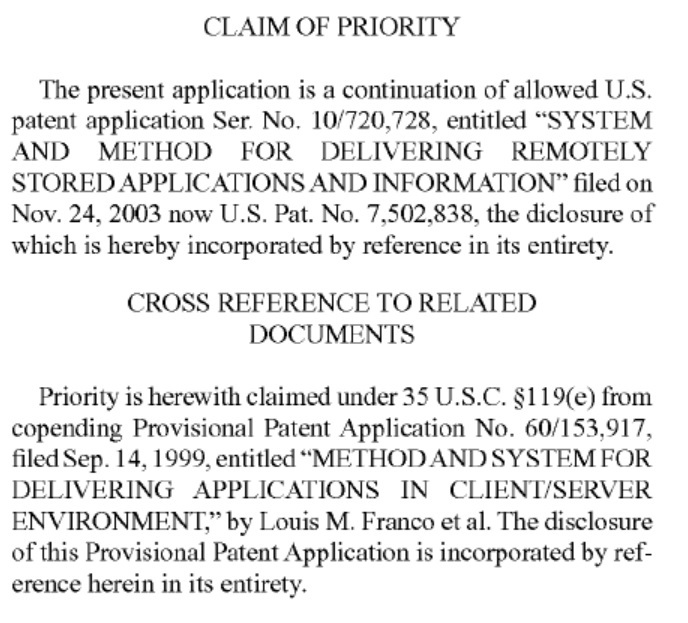 The Federal Circuit rejected Droplets’ characterization of the issue as “hypertechnical.” The Federal Circuit also rejected Droplets’ more creative argument that the priority claim was incorporated by reference from the application whose priority was properly claimed, finding §120’s “specific reference” requirement does not contemplate incorporation by reference. The Federal Circuit reiterated that a patent must contain a specific reference to each prior-filed application to be entitled to those applications’ earlier filing dates, and added that incorporation by reference cannot satisfy this statutorily mandated specific reference requirement. Because the patent at issued contained only a reference to its immediate parent, and not its grand parent, or great grand parent, the Federal Circuit affirmed the Board’s decision finding all claims of the patent invalid as obvious. In Perfect Surgical Techniques, Inc., v. Olympus America, Inc., [2015-2043] (November 15, 2016), the Federal Circuit reversed the PTAB decision in an IPR invalidating claims 1, 4–6, 8, 9, 11, 12, 38, 41–44, 46, 47, and 49 of U.S. Patent No. 6,030,384. The Board determined that PST failed to antedate the prior art because it had not proven that the inventor of the ’384 patent was reasonably diligent in reducing his invention to practice, and that the invention was anticipated or rendered obvious from the prior art. The Federal Circuit found that the Board erroneously applied a heightened burden of proof which “infected” its analysis. The Federal Circuit said that the Board should have weighed evidence of priority of inventorship under a rule of reason. Instead, the Board fixated on the portions of the critical period where PST did not provide evidence of the inventor’s specific activities to conclude the exercise of diligence was not “continuous.” The Federal Circuit said that under a rule of reason analysis, an inventor is not required to corroborate every day or what was done. The Federal Circuit found that the Board compounded its error by summarily dismissing the activities of the inventor’s attorney. An attorney’s work in preparing a patent application is evidence of an inventor’s diligence. The Federal Circuit further found that the Board’s focus on gaps of inactivity also led it to make fact findings unsupported by substantial evidence. The Federal Circuit instructed that on remand, the question before the Board is whether all of patent owner’s evidence, considered as a whole and under a rule of reason, collectively corroborates the inventor’s testimony that he worked reasonably continuously within the confines of his and his attorney’s occupations to diligently finalize the patent application during the critical period. Thus the Board’s finding that JP ’551 disclosed at least one “perforated” jaw because JP ‘551 referenced “a passage” cannot be supported. The Federal Circuit vacate the Board’s decision invalidating claims 11, 38, 41–44, 46, 47, and 49 over JP ’551 and remanded for proceedings consistent with this construction. The Board rejected NFC’s attempt to antedate the prior art with a prototype embodying the claimed invention before the priority date of the prior art. The Board held that even assuming that the prototype embodied the invention, NFC had not adequately established that a third party’s fabrication of the prototype inured to NFC’s benefit. The Federal Circuit said that an inventor’s testimony, standing alone, is insufficient to prove conception—some form of corroboration must be shown. However, there is no particular formula that an inventor must follow in providing corroboration of conception. Corroboration is determined by a “rule of reason” analysis, in which an evaluation of all pertinent evidence must be made so that a sound determination of the credibility of the inventor’s story may be reached. of the law. The Federal Circuit concluded that on the fact, particularly considering the amount of time that has passed, the inventor’s account was adequately corroborated. of the prototype. There was no record evidence of any other employee communicating with the fabricator. The Federal Circuit concluded that under the rule of reason, the totality of the evidence establishes the credibility of the inventor’s account. Thus, the Board erred in concluding that NFC had not submitted adequate evidence of conception, and in finding that the inventor’s account was not adequately corroborated. was not supported by substantial evidence. The Federal Circuit remanded, however, so that the Board could determine whether the prototype embodied the claimed invention.